No frakin way… Battlestar Galactica T- shirts! 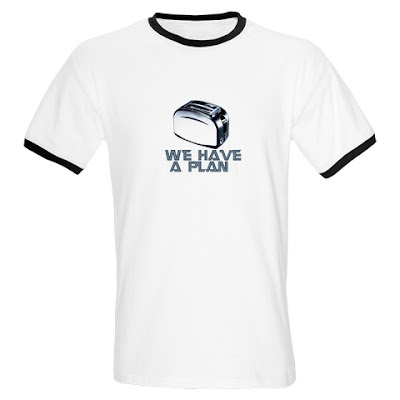 I particularly liked this one because even if you have been living under a rock for the last few decades and didn’t know about captain Odama and his crew of merry men, I think you’d still find the humor in this t-shirt, with the toasters having a plan. One sale at Cafepress and available in a number of different styles starting at $11.99 for a plain white Battlestar T-shirt through to £28.99 for a Women’s Raglan Hoodie there is something for every aspiring Starbuck. Click this link to go and get em. This entry was posted	on Saturday, July 28th, 2007 at 8:46 am and is filed under Retro, T-Shirt, TV. You can follow any responses to this entry through the RSS 2.0 feed. You can leave a response, or trackback from your own site.